At Greenbuild 2017, get the info you need on materials credits for LEED v4. The topic of materials is one that spans every phase of a building’s life cycle. It includes considerations of construction waste, specifying materials for the building’s structure in the design and construction phase, making green cleaning choices while the building is in use and determining what happens to the building in the demolition phase. Construction and demolition waste constitutes about 40 percent of the total solid waste stream in the United States and about 25 percent of the total waste stream in the European Union. 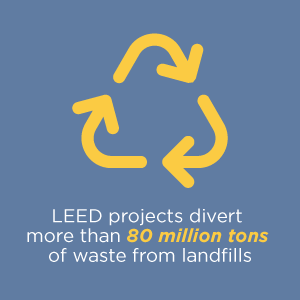 In aggregate, LEED projects are responsible for diverting more than 80 million tons of waste from landfills, and this volume is expected to grow to 540 million tons by 2030. Materials decisions are impacted by an array of stakeholders who work with the built environment and those who support it, as well as by those who work, learn, live and play within those buildings. Since its initial launch, LEED has always addressed materials, and the newest version of the rating system is no different. LEED v4 brings a shift that goes beyond materials decisions focusing on single attributes and moves the market toward conversations about optimizing environmental, social and health impacts and gaining a better understanding of the trade-offs. Join USGBC at Greenbuild 2017 in Boston, India, and China, to learn more about LEED and materials. In addition to educations sessions, Greenbuild in Boston and India will feature Expo halls where attendees can interact with the newest and most innovative products the market has to offer. Thurs., November 9 from 5–6 p.m.